Have you ever wished you could display all the available colors of a product in a search result or category listing? Do you like how Zappos.com makes it easy for their customers to see all the colors but when you click on a color it links you to the configurable and selects the color automatically for the customer? If swatch is selected on category page, the selected swatch and matching product image will be automatically selected when click through to the product page. Automatically preselect swatches and change product images to layered navigation selection on category and search pages! Many code improvements / speed enhancements. Having trouble deciding between our swatch extensions? 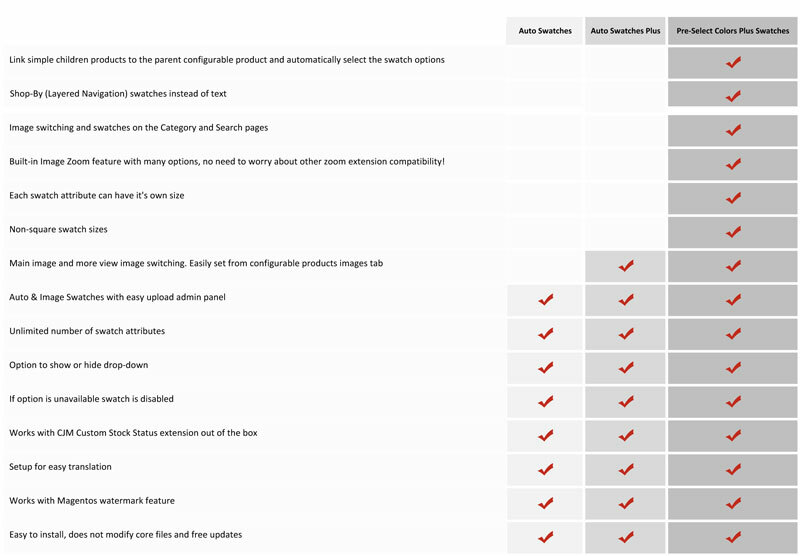 Check out comparison chart to decide which features are right for you! We are one of the very first and original swatch extensions for Magento! 3+ years of continued development, so you know our extension is fine tuned and ready for your store! No Ion Cube needed! Code is NOT encrypted and completely editable! We can customize the extension to fit your needs if you need features that are not already in the extensive feature set! See the full feature set below! Have you ever wished you could display all the available colors of a product in a search result or category listing? Do you like how some websites make it easy for their customers to see all the colors but when you click on a color it links you to the configurable and selects the color automatically for the customer? With this extension this is now possible! Create a configurable product, set the child simple products to visible, and this module links the simple products to the configurable and pre-selects the color attribute and changes the images to that color! You can also use this module if you have always wanted color swatches that will change the product image and more view images to match the color selected! Just upload all images to the parent product and easily set the options there. Don't bother making color swatches, because this module will make them for you! And if you need custom colors, you can also upload your custom patterns and swatches in the easy to use swatches panel where you can upload, edit and view your swatches. This module makes it much easier for the customer to see what they are getting, which in turn creates more sales! Your customers will love this! If set to visible, when the child product is clicked it will link to the parent configurable and automatically pre-select the swatch attributes of the simple product and change the images on the configurable product to the image of the simple. See all available color options in category and search listings! See all available swatch options for a configurable product in category and search listings and change images based on swatch selection right from the category and search listings! Sort by visual swatch images instead of text! Option to select which swatch attributes you want shown on category and search listings. Ability to have unlimited swatch attributes! If an option is not available for purchase, swatch is disabled but still visible! Automatically creates swatch based on color name or HEX value if there is no custom swatch uploaded. Easy to use swatch panel to upload your own swatches for patterns or mixed colors and edit and view swatches. Switches image based on which swatch is selected. Built-in Zoom function with many options (can be disabled). Changes more views to display images from just that option of product. Upload all images to configurable product and then set options from image tab. Option to set the size of swatch to whatever size you want for each swatch attribute. Setup for easy translation, includes EN language pack. Swatches are cached until product is saved again, or manually refreshed. Speeds up performance! Does not modify any core files. Free superior support and free updates. With Magento getting bigger and bigger everyday, we know that you have a choice when it comes to purchasing extensions to customize your store. We would like you to hear us out on why we think that we would make a great team! Free support! That's right, we will help you out should a problem come up. And we think our support is great, and so do our customers! See for yourself in the reviews. Located in the USA! We are a small business located right here in the USA, Michigan to be exact. We are experienced in what we do. You can trust that our extensions have been rigorously tested to ensure that they will function great on your store. Sure, there might be hiccups along the way due to custom themes, but we have made our extensions to be as transparent as possible. Meaning, no core files have been modified and there will be minimum invasion on your theme. And we are always here to help, if needed! We continually are updating our extensions to make them better. We will never be one of those companies who have 100's of extensions. We are much more into making what we have better and stay knowledgable with what we have. So you can be confident that new features will always be added, and yes, you can update for free! We like to customize! So you love our extension, but really need it to do something specific to your store? Well, we you can hire us to do such a thing at a very reasonable rate! We will also take on most Magento related jobs that you can think of. Shoot us an email and let us know what you need! We are designers. So expect everything to not only work great, but look great! Please feel free to email us or hit us up on our live chat on our site, even if it is just to say hi! We love meeting new people and we love hearing about your ideas, don't be shy.